A good first place to start in your quest for vital genealogical records is to search for a vital records index for the place where you suspect your ancestor was born, married, or died. Vital record indexes point to the locations of original records. You can use indexes to confirm that an ancestor’s vital records are available prior to submitting a request for the record. Or, in some cases, you can use the index to lead you to a digitized copy of the record (typically on subscription sites). And knowing the exact location of the record can often make retrieval of the record a lot easier. Although the majority of indexes are on subscription sites, sometimes you can find them on free genealogy project sites. To find these sites, you can conduct a search in a search engine for the locality, and then use the site search engine to find the individual you’re looking for. For example, Matthew is interested in acquiring a copy of the death certificate for his great-grandfather, William Henry Abell, who died in Kentucky. According to his headstone, William was born in 1873 and died in 1955. With this information, Matthew can begin to search for a vital records index. 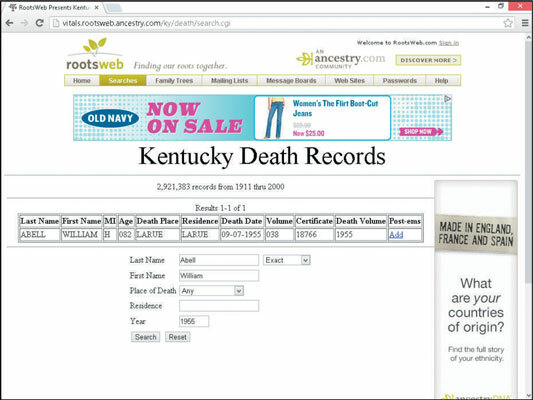 Go to the Kentucky Death Records site. You see search fields in the middle of the page. In the Last Name field, type the surname of your ancestor. In the First Name field, type his or her given name. Sticking with the example, type Abell and William. If you want to restrict your search to a particular place of death, residence, or year, type those values in the appropriate fields. For the example, restrict the search by Year (of death) by entering 1955. Wait for the results to return. Scan the results of your query. In this case, the results page contained one individual named William H. Abell. The death date — September 7, 1955 — and the age, 82, is consistent with the information on the gravestone. The database also supplies the record volume number and certificate number, which you can use to obtain a copy of the certificate.